Published on 2 July 2012. 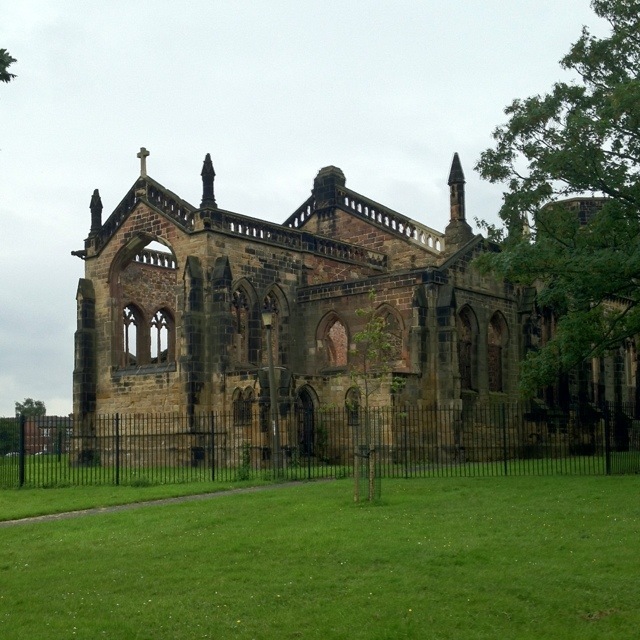 This is the ruin of Holy Trinity Church, which stands in Trinity Green in Stockton. I used to walk past this every day when I lived in Stockton and walked into uni. Holy Trinity Church was an Anglican church consecrated in 1835. In the 20th century, it suffered a series of unfortunate events. Just a year later – 1956 – stone began to fall from the church’s steeple, and it was soon found to be structurally unsound. The congregation failed raise the £20k needed to repair it, and so, in 1958, the steeple was dismantled. A decade on, the Anglican congregation dwindled here as elsewhere. The vicar launched a “getting to know you” campaign in which he went door-knocking in the local area, which did enough to keep the church going for a while. But 1979 brought another huge blow to the church after its organ – worth some £100k – failed. The church could not afford to repair it, and over time, the congregation and the collection plate shrank to an unsustainable level. The church was forced to close in 1982. Respite in prospect appeared in 1985, as the Greek Orthodox Church took over the building and spent £30k on overhauling the organ. But not long afterwards, the church was ransacked by vandals who stole candlesticks and communion wine – and destroyed the newly repaired organ. In 1991 – just six years after its reopening – the church was burned down in a fire, the cause of which was never discovered. Since then, the church has stood as a landmark ruin. The ex-churchyard, now known as Trinity Green, is used for all manner of cultural events. But with its grim history, how long can it be until another disaster befalls the Holy Trinity Church? This 1,708th post was filed under: Photo-a-day 2012, Christianity, Religion, Stockton-on-Tees.